Based on real events, this bestselling novel has the pace and drama of a gripping film. This novel contains two storylines that take place on two different spatial-temporal planes. In a small Czech village, nine-year-old Mira’s family succumbs to an outbreak of typhus in the 1950s. She ends up in the hands of her strange aunt Hana, with whom Mira spends the whole of her childhood and adolescence. Later on, she discovers hidden facts about Hana’s past and the tragic story of Mira’s own family, which is revealed to be Jewish. The second storyline of the novel is from World War II and shares Hana’s story. It takes place in Auschwitz and Theresienstadt, and explores the guilt motif that Hana felt over the death of her parents. 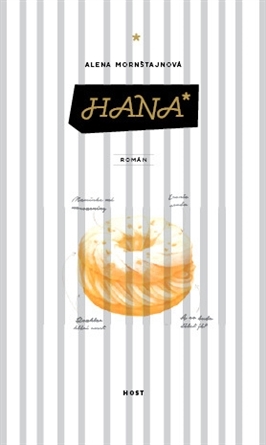 A page-turner, Hana is narrated in a traditional manner, with skilled realism, a flair for dramatic rhythm and composition, and with a deep knowledge about the time and circumstances of the story. As the novel comes to an end, there is a spark of hope, tinged by the belief that you cannot rid yourself of your family’s past and, indeed, of your fate. Alena Mornštajnová (b. 1963), a fiction writer, studied English and Czech at the University of Ostrava Faculty of Arts. Currently, she works as an English lecturer and translator. She made her debut in 2013 with the novel Slepá mapa (Blind Map), which was shortlisted for the 2014 Czech Book Award. Her second novel, Hotýlek (The Little Hotel), came out in 2015, and her latest novel, Hana, is a hit with both readers and reviewers.